Every homeowner needs to know which pests are a real threat to their homes and which pests are just annoying. Did you know that a single mouse or rat can leave roughly 3,000 microdroplets of urine behind every single day? These microdroplets contain viruses and bacteria that can get carried to your pantry or kitchen cabinets. Not only can the bacteria and viruses that rats and mice carry make you sick, but mice and rats are known for chewing through insulation and attic wiring. In fact, combined with squirrels, rats and mice are thought to cause approximately a quarter of all fires with unknown causes. Poison is not the answer if you have mice or rats, because they will likely die inside the walls, where they will decompose and stink up your home. While honey bees can be wonderful when you keep them in your yard, when honey bees start to invade your home, they can become a serious problem. A bee colony can swell to over 30,000 bees, and they can build hives that weigh several pounds. These heavy hives can not only cause damage on their own, but they also attract other pests, like rodents, moths and insect scavengers that can cause damage of their own. If you do kill the bees with insecticide, the hive can start to leak melted wax and honey, and this can also damage your home. That’s why a large, important aspect of honey bee removal is removing the hive. It’s bad enough when you find indoor ants crawling on your walls, on your counter and in your pantry, but it’s even worse when they crawl into electrical panels and drain pipes. Indoor ants can cause electrical problems, including blackouts, and well as plumbing problems, like backups. There are many different kinds of indoor ants, and knowing what species you’re dealing with will determine which treatment option will work best. Have an exterminator evaluate the infestation and identify the species so that you can get the problem taken care of promptly. Although no one wants to have pests in their home, some pest infestations are worse than others. 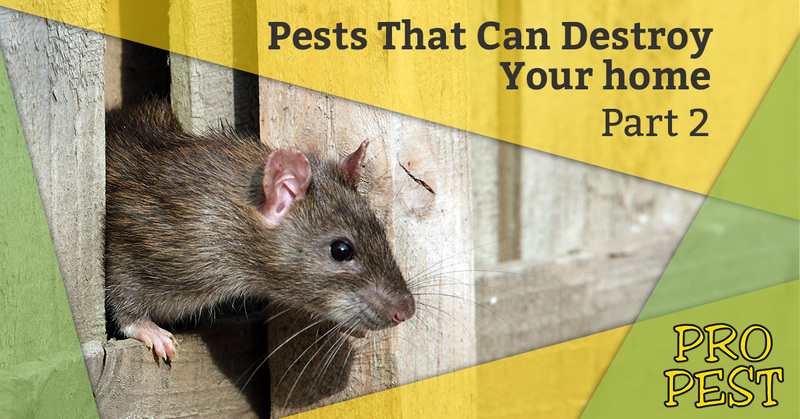 If you noticed any of the pests we’ve talked about in this blog series in or around your home, don’t wait to call in an exterminator to correct the problem. Your house is on the line, and as we talked about in our last blog, the damage caused by pests isn’t always covered by your insurance. Contact us today for your free estimate. Were you statisfied with your Pro Pest Bugs service?